These apples are a lot of fun to make. The variety of combinations you can come up with make it even more of a great activity for kids. 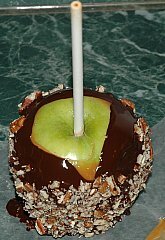 Place sticks into apples and place on a sheet of wax paper. Prepare caramel layer. Place unwrapped caramels and milk in a measuring cup. Using a measuring cup that the apple can fit in, will make it easier to cover the apple with caramel. Heat caramel for 30 seconds in the microwave. Stir and continue to heat 1 more minute until caramel is completely melted. 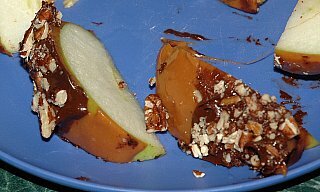 Dip apple into caramel swirling around to cover. Place on sheet of wax paper. Continue with all apples. Now prepare chocolate layer. In a measuring cup, add chocolate chips and shortening. Heat 30 seconds in a microwave. Stir and continue to heat until chocolate is melted. 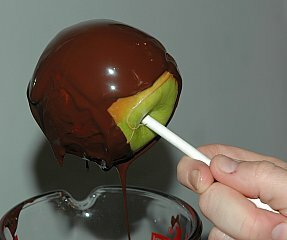 Dip apple in chocolate. Immediately roll in your toppings. Place on wax paper. Allow to set. You can store these in the fridge for several days wrapped up in plastic wrap. 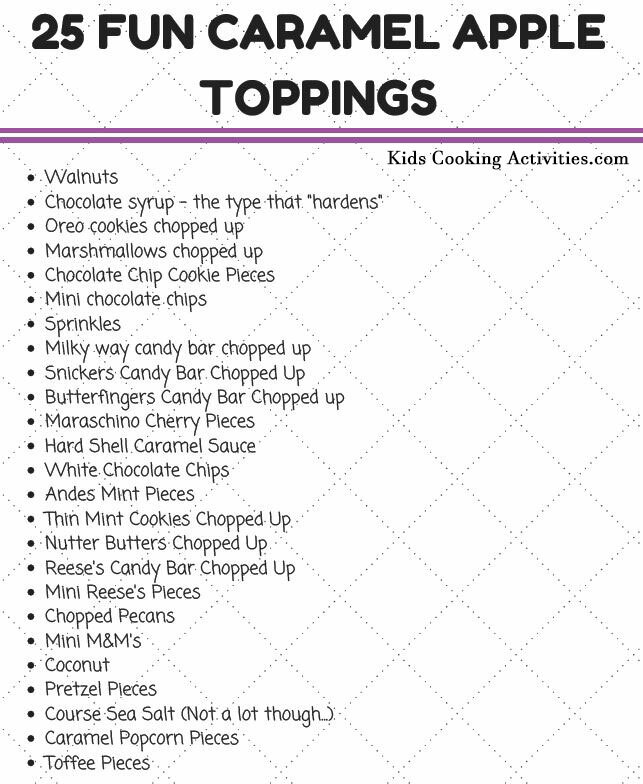 See more topping ideas in our list below. 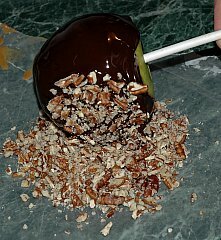 Cut your chocolate caramel apples into slices so it's easier to eat! Line a cookie sheet with wax paper. Spray the wax paper with cooking spray. 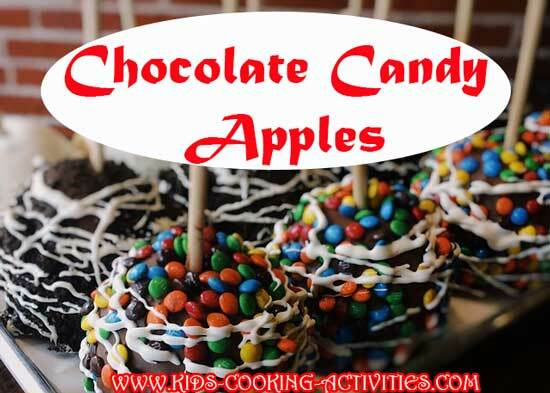 Stick the Popsicle sticks into the apples and set on the wax paper. Next, get out a knife that you can use to spread the caramel sauce on the apples. Unwrap all of the caramel pieces and drop them in a heavy saucepan. Then, add the milk. Turn a burner on medium-low heat and stir. Stir constantly or you will burn the caramel. Once everything is melted and all blended together, remove the pan from the heat. Then, start coating the apples and placing them back onto the wax paper. If you are adding any toppings, sprinkle the toppings on at this point before the caramel hardens. See topping ideas below. You might be wondering what exactly kids can do to get involved in this project. Actually, they can do quite a bit. 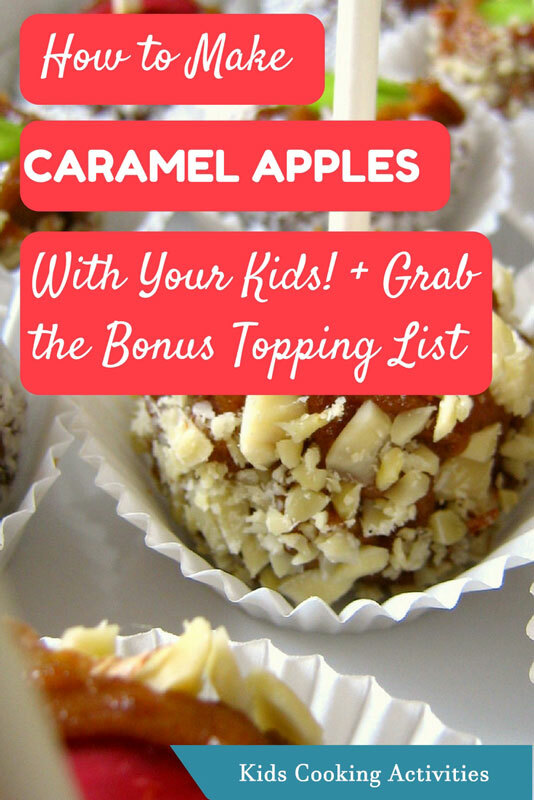 The above list are just a few simple ways that you can get your kids involved in making the apples. They will feel like theyve been so helpful and its a fun way that you can spend time in the kitchen with your kids.